Our first eagerly anticipated dinner was at Amass in Copenhagen’s Refshaleøen area which seems to a gentrifying industrial park (where Reffen is, too). I love that kind of locale. Because cabs are very expensive in Copenhagen and because T and I like pretending we're locals, we took the metro and then a bus (the 9A, which would become a regular for us) and then walked the short remaining distance to the restaurant complex. This would be nothing remotely interesting except that I had on a mini skirt and 4" stilettos, a) because I didn't know what Copenhagen expected re: dress code in nice restaurants, and b) why not? I love to dress up? It was a date. Etc. Seriously. Why is this not de rigueur? As we would experience so many times on this trip, the service at Amass was a perfect blend of friendly, knowledgable, and uber-skilled. The servers worked as a team; you never knew who would bring you what, but each knew exactly where you were and what you wanted, and it was just a touch of magic. The nightly menu is a fixed one of various size: we chose the largest in terms of course number and never once regretted it. 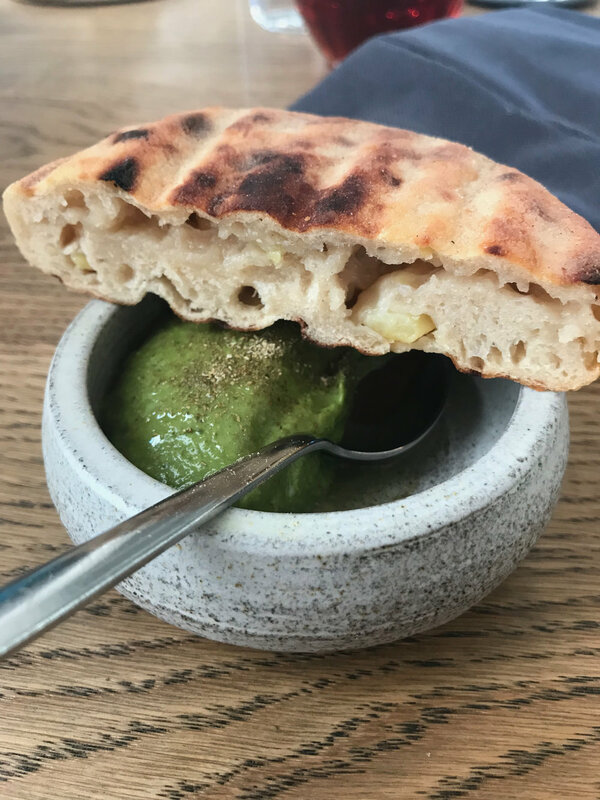 We started with a pappadum-like crisp made from potato skins and dusted with green garlic and fennel powder, served with a potato-skin dip drizzled with fennel oil. Then a fennel broth with mustard green oil and flowers, an insanely fabulous bread made from fermented potatoes, yogurt, and flour alongside kale-two-ways dip. I must have this bread in my life again. And, as another aside, that gorgeous vessel in which the dip was served? Yes, it's made by a Danish father and son ceramics team, Aage and Kasper Würtz, and you can bet I attempted to buy one (per my tendency to buy beloved items from restaurants). Not possible BUT the pottery was sold at Illums Bolighus, and I pilgrimaged to the: Copenhagen, Stockholm, and Arlanda airport locations. Only to be denied. I did purchase two plates and a bowl -gorgeous- but I really wanted this extreme-wall bowl. Alas. Then onto a fava bean and cherry with lemon miso salad, and then a tiny 'burrito' of cured mackerel with cured egg yolk and horseradish wrapped in a Swiss chard leaf. The latter was a standout item. On to what was absolutely one of my favorite-ever dishes, roasted beets with black and red currants and beet reduction vinaigrette. Y'all, I cannot even describe the marriage of earthy, sweet, tangy, and smoky in this treat. Lawd! Then, a rare cut of beef aged approximately 978 years with flowers and more (honestly, by this point I was just going with it) and then a s'more and then, a top-three highlight, malted barley cream with rhubarb sorbet and gratinee of herbs. I really do not know what to say about the malted barley cream except that I wish it were a mandated daily staple in my life. That is written/said with zero exaggeration. It was the best meal we had in Copenhagen and certainly one of the most memorable of our lives. If you are in Denmark's capital area, do make a point to eat at Amass. You do not need stilettos. Just bring an empty stomach! Ekstedt, a Michelin-starred restaurant in Stockholm’s Östermalm district, was one of the very best meals Tom and I have ever enjoyed. Opened by chef Niklas Ekstedt in late 2011, the eponymous eatery manages to offer exceptionally creative dishes crafted from the best quality local ingredients while remaining warm, friendly, and utterly without pretension. We looked nice but didn’t have to dress in an overly formal way, which we often feel makes a dining experience even better. Ekstedt offers a fixed menu each night --five courses with the option to add on two additional dishes. You are welcome to add a wine pairing or order drinks a la carte, and the restaurant lets you know in advance that you should plan to spend roughly 3 hours enjoying the meal. You are also, in advance, welcome to note any allergies or dietary restrictions you have so that they can accommodate your needs. I don’t eat offal or baby animals, for example, and they had beautiful and equally delicious replacements for, say, the smoked reindeer heart that was chopped into the “Nordic taco” Tom started with. I had some gorgeous forest mushrooms. The service was the smoothest choreography of professionalism, deep knowledge of the menu, and sincere enthusiasm for taking diners through the culinary tour: the kitchen and wait staff are having fun, and it shows. The lighting is dim enough to be relaxing but not to hide the food or strain middle age eyes, and the music is a compilation of old hits. If I had to succinctly describe the décor, I’d call it rural Nordic industrial. hay-fired mushrooms with sweetbreads (I got something other than sweetbreads! ); and a rhubarb sorbet with strawberry something and a sublime nut butter and toasted nuts. It was a truly spectacular, inspiring, memorable meal and was worth every penny. If you’re heading to Stockholm and want to treat yourself to something special, make an advance reservation and go to Ekstedt!